The Silk Road is a series of trade and cultural transmission routes that were central to cultural interaction through regions of the Asian continent connecting East and West Asia by linking traders, merchants etc. during various periods of time. Upon arrival in the airport, pickup by our English speaking tour guide and drive to hotel. Then driving about 2 Hours to the Heavenly Lake for our visiting. Free time at the International Grand Bazaar at night. [ Optional ] International Grand Bazaar: In Urumqi, a bazaar is more than just a place to buy things. It offers locals a place to enjoy the flavour of a festival, to have a rest and to meet with friends. People barter goods, exchange information, and even gossip at the bazaar market. Drive 90 minutes to Turpan. Explore mysterious attractions & culture in Turpan. 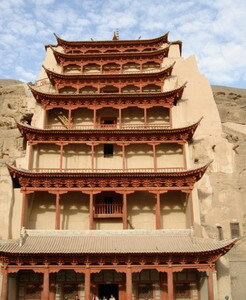 Bezeklik Thousand-Buddha Caves is situated at the north bank of Muzat River in Turpan, a collection of retreats once inhabited by Buddhist monks, as well as the imperial monasteries for local emperor during the Gaochang Kingdom and Tang Dynasty. [ Optional ] Grape Valley: The small paradise, a thick maze of vines and grape trellises, is located at the foot of the Flaming Mountain, there are more than 10 kinds of grapes in the area. 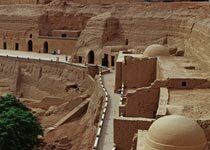 In the morning, we tour the ancient city of Jiaohe (Yarkhoto) near Turpan. We return to Turpan and ride on donkeys before wandering the lively Turpan city weekend bazaar. The Turpan city bazaar is famous for its handicrafts which attract tourists from all over Xinjiang. We will take our overnight soft-sleeper train to Dunhuang. Train No. : k1352 (depart Turpan at 23h05, arrive Dunhuang at 07h32 next day), stay overnight on the train. It is designed in a simple Afghani style and was built in 1777 AD by a local ruler in order to show the impressive memories of his father's contribution to Qing government. These underground channels rate as one of ancient China's greatest public works projects as the Great Wall and the Grand Canal. The city of Turpan owes its existence to these vital wells and channels, some of which were constructed over 2000 years ago. 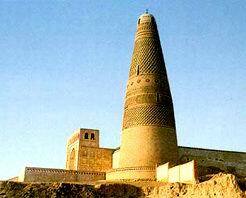 The Ancient City of Jiaohe is situated at Yar Town, 13 km west of Turpan City. It was first the capital of the State of South Cheshi, which was one of the 36 kingdoms in the Western Region. [ Optional ] Turpan-style food: Turpan-style food is tea with home-baked bread, Pamirdin, kebab, and fruit. Pamirdin is a type of pie, contains lamb, carrots and onion. kebab is served wrapped in bread with a salad and a dressing, it includes grilled, roasted, and stewed dishes of large or small cuts of meat, The traditional meat for kebab is lamb. Upon arrival at liuyuan railway station at 07h32, pickup by our English speaking tour guide and drive 3.2 hour (138km) to hotel in Dunhuang, you will have breakfast in the hotel. In summer time, rooms are ready after 12h00. After breakfast, we will go to visit Mogao Grottos and the Crescent Moon Spring & Mingsha Mountain. The Mogao Grottoes (Mogao Ku) also known as the Thousand Buddha Caves, constitute one of the three major Buddhist grotto sites in China. It is one of three noted grottoes in China and also the largest, best preserved and richest treasure house of Buddhist art in the world. [ Optional ] Crescent Moon Spring & Mingsha Mountain: Crescent Moon Spring is 6km south of Dunhuang in the Singing Sands Mountains and is quite literally an oasis in the desert. The Spring's name derives from the crescent moon shape the small pool of spring water has taken between two large sand dunes. Although the area is very dry, the pool doesn't dry up as one might expect. The Dunhuang Meseum is built on the former residence of Taoist Wang Yuanlu, who found the Cave by chance about 100 years ago. It display the cultural relics found in the world-famous "Sutras Cave" of Mogao Grotto. [ Optional ] Dunhuang Shopping: Shopping in Dunhuang, you can not only buy adoring special products and handicraft products, but also hear background stories and beautiful legends of traditional culture. 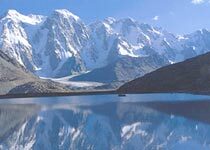 international travel service, focusing on China hiking, photography, train and family tours. © 2004-2019 China Discover.net™ All rights reserved.